Fairfax County recently released this video about the new bike room at the Wiehle-Reston East Metrorail station. The room can hold 208 bikes but the capacity can be expanded. FABB provided some feedback on the types of racks being used. See the bike program website for details. With summer around the corner Ozone levels will be rising in the region. Ozone is the most widespread air pollutant in Fairfax, created by the reaction of sunlight on emissions from vehicles and other air pollutant sources. Bicycles are the ultimate clean-air (zero emissions and zero carbon dioxide) form of transportation, but the impact of ozone pollution on lung tissue can be serious. The effect excessive ozone and poor air quality exposure on cyclists’ athletic performance can last for several days to weeks. There is a bright side – and Clean Air Partners can help area cyclists protect their health during poor air quality days. Regional air quality organization Clean Air Partners offers AirAlerts. AirAlerts are free, daily air quality notifications that inform recipients when the air quality forecast will be unhealthy and when it hits an unhealthy level (Code Orange or Red) in real-time. Users can get AirAlerts sent directly to their email and also use the Clean Air Partners Air Quality App for on-the-go information. What does it mean for cyclists? CODE GREEN: Get on your bike. Riding a bike on short trips will save gas and help protect the air. CODE YELLOW: Bike Less. Air quality is acceptable but this could cause health concerns for sensitive groups (such as athletes and those who spend a lot of time outside). Travel on quieter routes with less traffic, away from tailpipe emissions. CODE ORANGE: Limit biking and other physical outdoor activity. Carpool to work a few days, or even one day a week when the air is unhealthy to breathe. If possible wait to ride your bike at dusk. CODE RED: Put away the bike. Take public transit or telecommute and limit strenuous outdoor activity when their air is unhealthy to breathe. Everyone is sensitive to this level of poor air quality and should avoid prolonged outdoor exertion. CODE PURPLE: Don’t even think about it. Take public transit or telecommute to reduce your contribution to air pollution and greenhouse gas emissions. Everyone, especially sensitive groups, should avoid any physical outdoor activities as pollution levels are very unhealthy. Clean Air Partners would like to thank cyclists in Fairfax for contributing to an overall improvement in our community’s air quality and environment. Have fun and make sure you check out cleanairpratners.net to sign-up for AirAlerts! Today the Post carried a good article on bicycling in the DC Metro area. The online and print titles sum up the content: How Washington cyclists can stay safe as more bikes hit city streets (online) or the print title "Investments by Arlington and D.C. set the pace for a cyclist-friendly region." WABA's bicycle education program is featured in the first part of the article. Our parent organization is doing a great job teaching safe cycling skills in DC, Arlington Co, and Montgomery Co., with affordable or free classes that fill up on a regular basis. In the District, the first local jurisdiction to create protected lanes, a new one recently opened on M Street, boosting the well-used “cycle tracks,” as they are sometimes called, on 15th and L streets and Pennsylvania Avenue, all in Northwest. One more sign of how popular bicycling is becoming in our area. "The inaugural Kidical Mass Falls Church ride this past weekend was a great success. There were 32 adults and lots of kids along for the ride. We're hoping to have monthly rides. If you're interested in learning about future events, you can join the FaceBook group or follow on Twitter @KidicalMassFC." According to Ward, "A proposed $100 million transit referendum earmarks $85 million for new bikeways and pedestrian paths. The outlays come on top of more than $200 million in bike-ped projects already approved." For one, the referendum is for funding "transportation" projects, not "transit" projects. The $85 million is mostly for sidewalk projects that are part of a total of $200 million for sidewalks, trails and a very few on-road bike projects, NOT "on top of more than $200 million in bike-ped projects." Most of the projects under consideration are sidewalk retrofits in neighborhoods that were built without them. There are very few bike projects being funded. The funding for one interchange on Fairfax County Parkway alone is costing $90 million (the first three road projects listed will cost nearly $350 million). The actual bike funding is a pittance compared to the $1.4 billion total of mostly road and transit projects. Springfield District Supervisor Herrity has made a habit of criticizing bike projects and calling for the elimination of the bicycle coordinator position. He's the only supervisor quoted in the article. 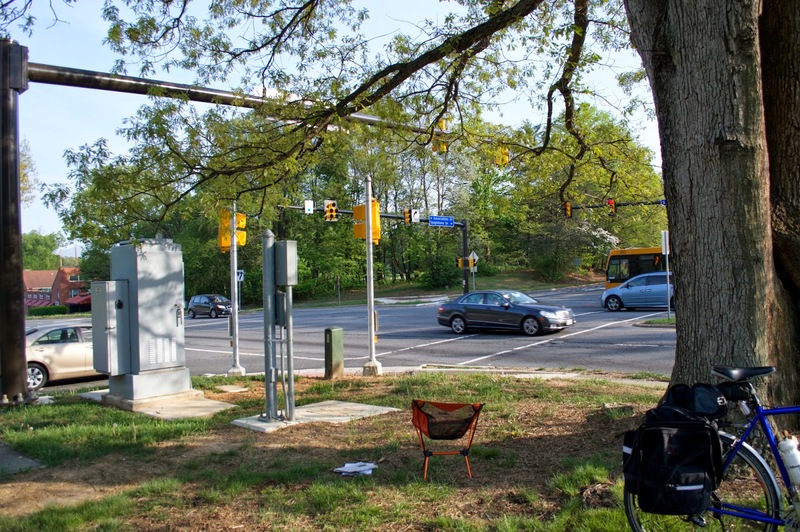 As TheWashCycle points out, maybe he's referring to the Soapstone Connector in Reston that will have bike lanes and sidewalks. Even so, the bridge is 99.5' wide. There are four 12-foot travel lanes taking up 48 feet of right of way. Bike lanes and sidewalks make up 25 feet of right of way. In other words, in the first four paragraphs there appear to be at least 3 blatant errors of fact. Ward spoke to someone from Potomac Pedalers Touring Club and managed to extract two negative quoits about bike lanes and sharrows. I'm quoted in the article but no attempts were made to contact me. Ward is the same reporter who wrote a very anti-bike article about Arlington's attempts to become more bike-friendly, Arlington peddles bikes at expense of cars, taxpayers. See our earlier posts about the 2014 transportation bond. Update: Fairfax Co recently posted a list of projects to be included in the 2014 Transportation Bond. Repaving of sections of the Parkway trail from Route 7 to New Dominion Parkway is complete. Large cracks in that section will be filled by another contractor who will begin work soon. When working from Route 7 south the contractor was having to work against traffic which was causing delays. Even though the trail work was off road, the asphalt truck was using the shoulder of the Parkway. VDOT has decided to begin work at the southern end of phase one at Route 50, working north with traffic to New Dominion Parkway. We heard from a cyclist who was concerned about the smoothness of the new asphalt patches. VDOT has agreed make sure the patches pass their smoothness tests. Where: From Rte. 50 to Stringfellow Road. Alan Young and his grandson James discovered this week that VDOT Fairfax County has repaved roadside trails in Alan's neighborhood, connecting Rolling Road and Burke Road homes to Rolling Road VRE Station! The trails were in desperate need of repair. There were holes in the pavement and tree roots. Now, they have smooth pavement to encourage them to ride to adjoining neighborhoods, the VRE station and beyond! "We are so pleased that VDOT Fairfax County is paying attention to our pedestrian and bicycle needs! Thanks VDOT Fairfax County!" Tour de Fat is a week away! Tour de Fat is almost here! The free bike party starts at 11 a.m. on Saturday, May 31 at Yards Park in DC. Join hundreds of cyclists for a day of bike fun, beer, and food. The event is a major fundraiser for FABB. Activities include the infamous Bike Pit where riders try out various trick bikes, the Slow Ride Race, le Tigre tent, and great music on two stages. We still need some help at our ID/Wristband station. FABB volunteers receive 2 beer tokens and a Tour de Fat t-shirt. Let me know if you can help. We're back in DC and it's still free! But, if you donate through Eventbrite, you'll be benefitting your local DC nonprofits AND receive some sweet Tour de Fat schwag**. This year marks the 15th season for Tour de Fat, which will travel to 10 cities across the U.S. These day-long festivities are free in every city, but the proceeds from beer sales and pre-registration donations go to local non-profits. Since its inception, Tour de Fat has raised more than $3 million, and raised $500,000 last year alone. A celebration of bike culture and advocacy, the Tour de Fat features eclectic entertainment, from musical acts to yo-yo performers, bike contests and even vaudeville acts. This year will also include some brewing education and feature a “Bicycle Revival” to inspire festival-goers to believe in the power of two-wheeled transportation. **A city-specific 2014 Tour de Fat license plate or frog light included with any donation of at least $5. A women's only League Certified Instructor (LCI) class will be offered by the League of American Bicyclists in Washington DC on the weekend of June 20-22. The prerequisite for taking the course is successful completion of Traffic Skills 101. This prerequisite is being held May 26 and May 31. For more details, see the League Seminar Schedule page. For more info on the May 26 & 31 classes, contact the instructor. 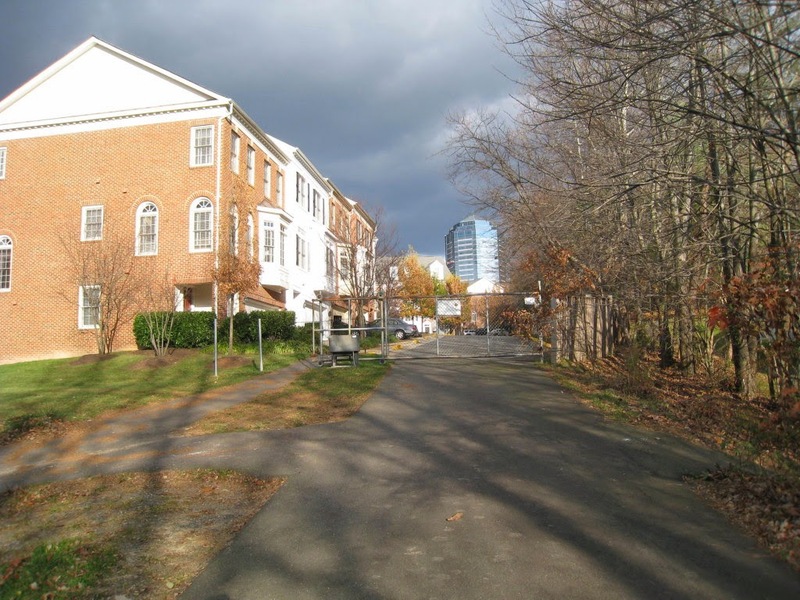 The Ashgrove Lane Trail is a major bicycle connection to Tysons from the W&OD Trail and neighborhoods to the south. The trail is an abandoned road owned by the Park Authority and it is in need of repair. Trail improvements are desperately needed. According to the Park Authority, during construction "The trail will be open from time to time, mostly on evenings or weekends when the contractor isn’t working, but it is impossible to predict on a daily basis." From the Fairfax County Park Authority Ashgrove Lane Trail Improvements page. The Fairfax County Park Authority will begin construction on a project to repair and resurface approximately 465 linear feet of the Ashgrove Lane Trail in Old Courthouse Spring Branch Stream Valley Park (see attached map). The contractor, Environmental Quality Resources, LLC, will be mobilizing on site on or about June 6, 2014. Access to the site will be from Northern Neck Drive. Construction will take approximately one month, depending upon the weather. Residents should expect occasional construction traffic with equipment and materials through Westwood Village and construction equipment on the trail during the construction period. As a safety precaution, the existing trail connection to Irwin Irvin Street will be intermittently closed to users during the project and signs will be posted accordingly. Please feel free to contact me by email at Elizabeth.Cronauer@fairfaxcounty.gov or by phone at 703-324-8629 if you have any questions regarding this work. An up-to-date schedule will be posted on the Park Authority’s website. PEOPLE WILL BE ASKED their opinions about Town services such as: street maintenance, water/sewer service, traffic/transportation issues, snow removal, leaf collection, street sweeping, street lighting, cleanliness of streets and buildings, Community Center programs and recreational opportunities. #They may also be asked, for example, about quality of neighborhood life in Vienna, property maintenance in the neighborhoods, trash and recycling, service received from town employees, Vienna’s budget, communication of Town information, public safety, community events and various town policies and procedures. I'd like to know when Church Street will be repaved. The road is in terrible condition and many cyclists use it to avoid Maple Ave. Today I noticed that a few of the larger potholes were roughly patched with asphalt. Much more needs to be done. Sally Smallwood, the Fairfax County Public Schools Safe Routes to School Coordinator, is the invited guest at tonight's FABB meeting. She'll discuss efforts underway in Fairfax to encourage more kids to walk and bike to school. The meeting is at 7:30 p.m. at Patrick Henry Library, 101 Maple Ave E, Vienna, a block from the W&OD Trail. We'll also be discussing upcoming events such as the Tour de Fat on Saturday May 31 (we still need some volunteers) and the Tour de Tysons on Sunday June 29. Kidical Mass Falls Church wants to get you and your family on bikes! The Kidical Mass idea was born out of Oregon in 2008 to get more families cycling together. 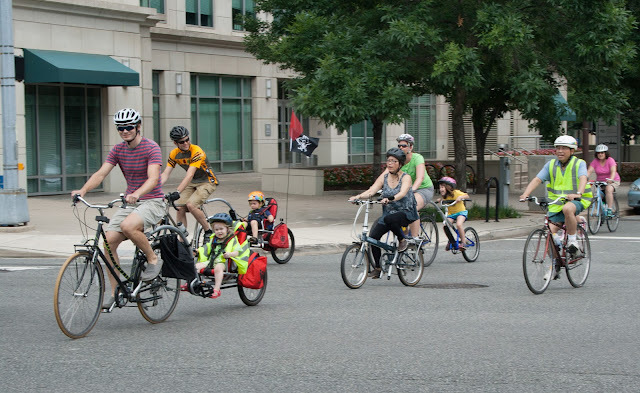 There are Kidical groups in DC and Arlington but we'd like to share the spirit of safe and fun family cycling with others in the immediate area. Trailers, trail-a-bikes, cargo bikes, box bikes, child seats, kids on their own wheels and adults that support cycling are all welcome! Events happening monthly. Our very first Kidical Mass ride! Sunday, May 25at 11:30am, Bikenetic, 922 W Broad St., Falls Church, Virginia 22046. 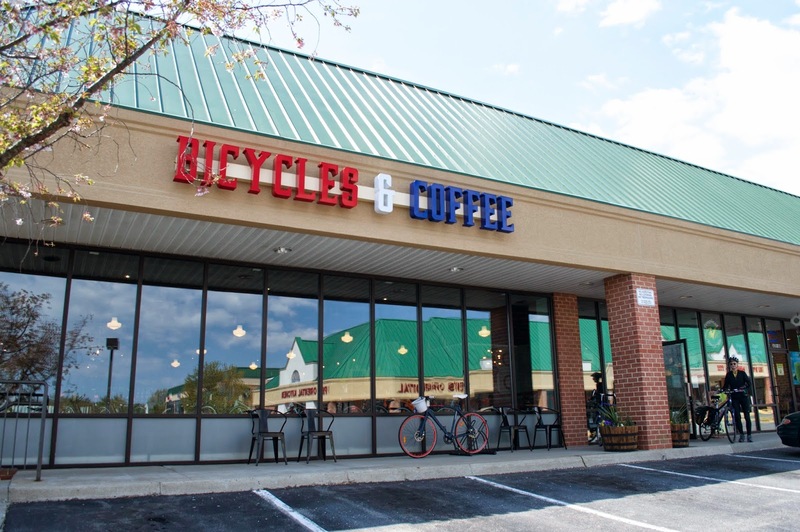 While on Paul's Ride we visited the new bicycle and coffee shop that had just opened in Purcellville, Veloville USA. 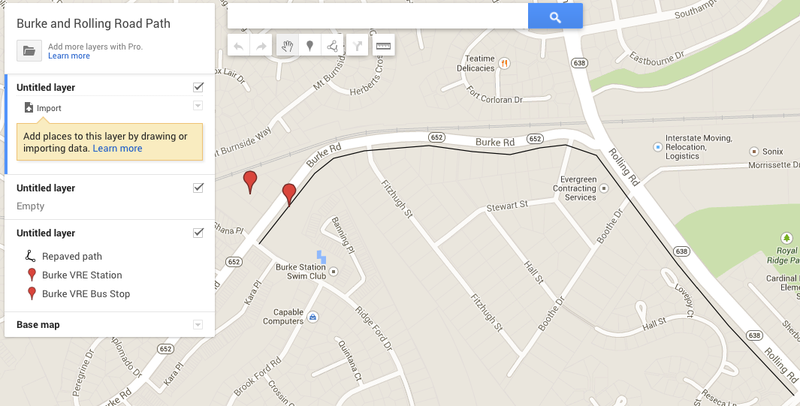 The shop is located just off the W&OD Trail at Maple Ave. and Main St. near Loudoun Valley High School. The shop is owned by Scott and Nicole Davison. The couple formerly worked at "one of the largest bike shops in Portland, Ore" and decided to return to this area and create a "unique, family-oriented cycling shop in Purcellville." “We wanted to create a destination for both locals and visiting cyclists from surrounding cities. This area has become a hotspot for cyclists, both serious road riders and W&OD cruisers alike. We thought it would be nice to have a place to grab a cup of locally roasted coffee pre-ride or wind down post-ride at the service bar and regale us with the day's adventure,” Nicole Davison said. The Davisons completely stripped the interior of their store and redesigned it using local wood from Round Hill and Riverbend Saw Mill, to create an “inviting” atmosphere with a vintage feel. They purchased an Italian espresso machine, to lure people into the shop for coffee, conversation and community. They use Hopscotch coffee from Winchester and will open the coffee bar at 7 a.m. Grab and go snack selections, including organic, vegan and gluten free options, will also be available. Nicole Davison said the shop caters to women cyclists and as a result, they offer women's specific bicycles, helmets, shoes and clothing. They also offer a weekly women's ride and monthly informative clinics for women. With the growing wine and tourism industries surrounding Purcellville, they have a full fleet of bicycles for rental including a delivery service to area B&Bs and inns. Purcellville, a town with less than 8,000 residents, is now home to three bike shops: Trails End Cycling Company, Velo Classique, and Veloville USA. By contrast Reston, with around 60,000 residents, has two bike shops. I doubt there would be three Purcellville bike shops if the W&OD trail did not exist. The rain was coming down hard when I stuck my head out the door at 5:30 a.m. to ride to the Reston Bike to Work Day pit stop to volunteer at the FABB table. By the time I left at 6:15 the rain was very light and it was a surprisingly nice ride to the pit stop at the Wiehle-Reston East Metrorail station, site of the future mixed-use development Reston Station. A steady stream of soggy but upbeat cyclists visited the pit stop throughout the morning. I estimate that about 1/2 of the 500 or so people who signed up showed up. Some drove but most rode, and the conditions weren't that bad. Those who did show up had a good chance of winning one of the many raffle prizes offered by sponsors. We were lucky to have an indoor option thanks to Comstock Partners, developers of Reston Station. Thanks to all the volunteers at the Reston and other pit stops around the county, and a special thanks to the volunteers who represented FABB at most of the events. Update: See Connection article Biking to Work Despite Rain: Bike To Work Day highlights alternative travel in Fairfax County. Inside the Reston Station development. The weather forecast for tomorrow morning is not looking good. The rain is expected to clear up in the afternoon, but if you plan to join one of the many Bike to Work Day pit stops, be prepared for rain. What I've found is that even with a forecast of rain there are many periods when the rain has either stopped or is light. There have been a couple of wet Bike to Work Days in the past. In both 2005 and 2008 it rained off and on throughout the morning. As I recall, the weather had mostly cleared by the afternoon. In 2008 274 of the 500 people who registered for the Reston pit stop showed up. Most of us have good rain gear and a wet Bike to Work Day is a good time to test it out. Obviously if there is thunder and lightening everyone needs to decide whether they think it's safe to ride. You also need to ride carefully as the roads and trails are more slippery and motorists might have a more difficult time seeing bike riders. Be safe. Also check out Your last-minute guide to Bike to Work Day by Shane Farthing of WABA that appeared in the Washington Post today. Despite a slow start, work on the Fairfax County Parkway Trail seems to be back on schedule. The crew is now working between New Dominion Parkway and Baron Cameron Ave, just north of the W&OD Trail (the work area may extend further north; we didn't check today). The view on the right is looking north from New Dominion Parkway. We're hoping that the debris that accumulated on the trail this winter will be removed as part of the project. When work on the section between the W&OD Trail and Sunrise Valley Dr is underway, it will be very difficult for bicyclists to bypass the work area as there is no grassy median over the Toll Road and just south of there, so plan your trip accordingly. The trail should be open before 8 a.m. and after 4 p.m. There are few detours in that area; the trail is a critical north-south link for a reason. During the most recent volunteer bike count at that location on May 8, during the evening rush, 5-7 p.m., 46 bicyclists were counted. As a side note, there were 362 bicyclists in that two-hour period on the W&OD Trail, nearly 100 more than in the Sept 2013 count during the same period. See the VDOT page on the trail work for details. 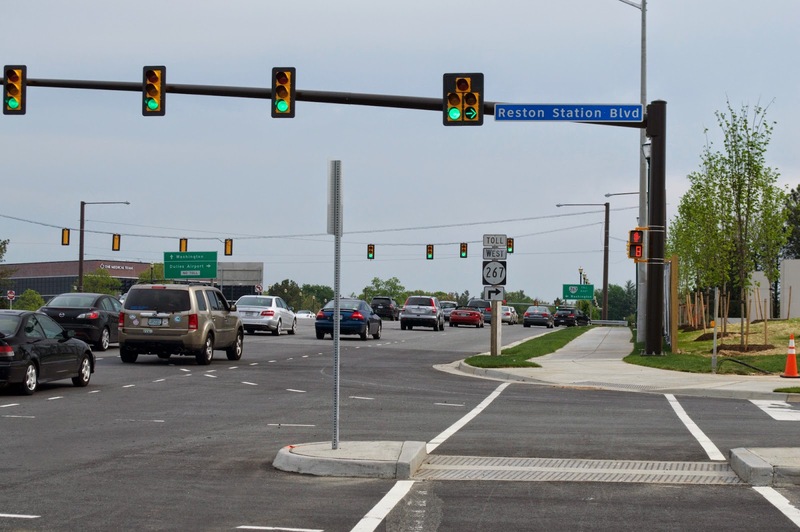 The Reston Pedestrian & Bicycling Advisory Committee is writing a letter to VDOT and FCDOT about "Critical intersections surrounding the Wiehle-Reston East Metro station." They are proposing specific changes to improve ped/bike access to the station. The letter will be discussed at their meeting tonight at 7 p.m. at Reston Association headquarters, 12001 Sunrise Valley Drive, Reston. The committee "invites any interested RA members to attend and voice any concerns they have so we can try to include their input." I plan to attend the meeting and have a number of concerns including curb ramp design, motorists turning right on red and ignoring trail users, ped signal timing, and bicyclists being able to activate traffic signals at the Isaac Newton Sq/Sunset Hills Dr intersection. Another concern relates to the traffic signal at the entrance to the station at Reston Station Blvd. Why is the right turn arrow green when the pedestrian signal is indicating pedestrians and bicyclists should be crossing? I don't think there is a need for the green arrow, which I think encourages motorists to turn right without yielding to people in the crosswalk. Fairfax County will be holding the 4th Annual Transforming Tysons Open House on Monday, May 19 at 7:00 pm at Spring Hill Elementary School (8201 Lewinsville Road) to provide information on proposed development activity, ongoing transportation studies, potential Comprehensive Plan changes, and park and public facility plans for Tysons. More information on the Open House. Do you work in Tysons? If so, we really want to hear your thoughts on what park and recreational opportunities should exist in the Tysons of the future. Please stop in and meet with Fairfax County Park Authority planning staff at the Tysons Parks Open House, Thursday, May 29, 2014 from 12:15 p.m. until 1:30 p.m. Stop in and learn about park planning for the Tysons area. This is a great opportunity to tell planners what you want to see. The informal gathering will be held at Tysons Pimmit Regional Library located at 7584 Leesburg Pike in Falls Church, VA. The Park Authority published the Draft Tysons Park System Concept Plan last month, putting in motion the opportunity for public review and comment on this planning document. The Tysons Park System Concept Plan will guide future park development by the public, private and non-profit sectors that will serve Tyson’s residents, workforce and visitors well into the future. The plan is available online atwww.fairfaxcounty.gov/parks/plandev/tysons-park-planning.htm A 60-day public comment period closes on June 16, 2014. There is still time to register online for Bike to Work Day, which is Friday, May 16. T-shirts are available if you register early. Registration is free. This year there are new pit stops in Fair Lakes and McLean. Even if you ride to work every day, Bike to Work Day is a great way to celebrate the many benefits of bike commuting. Most pit stops have free breakfast, raffles, and information displays. Participation numbers are used to show how bicycling is growing in the region so we encourage everyone to sign up. Stop by and say hi to local FABB reps who will have maps, route and safety info, and e-newsletter sign up sheets at most of the pit stops. In today's Post Dr Gridlock discusses the role that huge Metro parking garages have on suburban development, and the need to provide options for getting around our area, like bike lanes in the suburbs: Metro stations created car magnets in the suburbs for sake of livable downtown. "When a co-worker asks if you take Metro to work and you say “yes,” are you leaving something out? For tens of thousands of Metrorail riders, the transit commute starts in a car." Metro certainly cuts down on the number of car trips into the D.C. region’s core, which is swell for those who live and work in the core. But it adds tens of thousands of car trips each day in suburban communities. Many of those trips are short — just enough to jam streets and highway exits. He notes that Fairfax did the right thing by not investing in car parking at the Tysons stations (there will be bike parking at each station). However, we are spending millions in regional transportation funds on building huge parking garages at Innovation Center and Herndon Metrorail stations. There will be room to store 2037 cars at Innovation Center and 1975 new spaces at Herndon, when added to the current 1745 spaces, totals 3720 spaces. Most of those spaces will be used to store cars from Loudoun Co and beyond. What's the solution? Investing in all modes benefits everyone by taking cars off the road. According to Dr. Gridlock, "A greater investment in buses, bike lanes and walkable communities in the suburbs won’t end congestion around Metro stations, but it could ease commutes for everyone, including drivers." It will help reduce congestion around stations; maybe not end it, but at least if it is safe to ride to the stations it will be a viable option for anyone willing to ride a few miles by bike. Fairfax needs to keep up with it's neighbors. According to another article that appeared in today's Post (Washington is a walking, biking city), the District will add 14 miles of bike lanes this year to add to 50 already in place. Washington has kept pace with its peers, creating more than 50 miles of bike lanes and planning to add 14 miles more this year. The popular Capital Bikeshare program puts more than 2,500 short-trip bikes on District and suburban streets, and it plans more expansion this year. Because we haven't invested in a fully funded bicycle program, our bike coordinator doesn't have the funds to do the job. 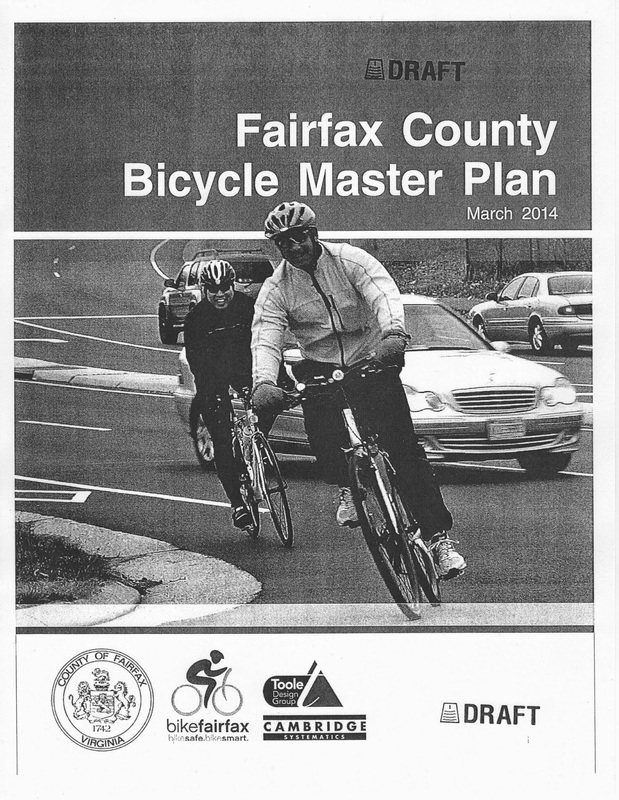 The Bicycle Master Plan has been in draft form for nearly 2 years. Public hearings were postponed recently until at least September. It would be nice if the plan were at least available to the public but it's not even on the county website. A final version should be posted soon. Day 5 is in the books of Vienna's Bike/Walk Challenge Week. Over 5400 kids walked or biked to school all week. The Overall Challenge Cup goes to first timer Westbriar ES with a bang up job on the last day of the 5 day challenge - with 178 kids walking or biking to school. Vienna ES bike racks with 186 bikes! Westbriar got smart and tapped into a group of kids who otherwise get driven to school - the morning SACC (before school care) group. About 15 kids from SACC walked or biked on the last day, the highest number yet. They are a hard group to get because parents are typically rushed to get to the office! Vienna placed second overall with it's focus this year on setting new highs for kids who bike to school. 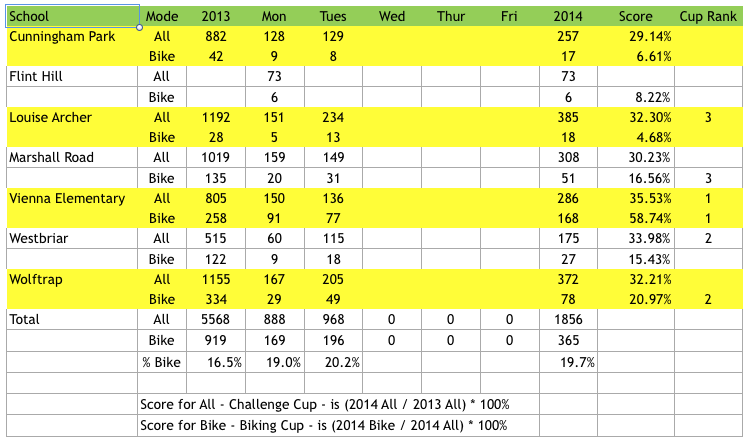 As a result it took the Bike Cup for the third year in a row. 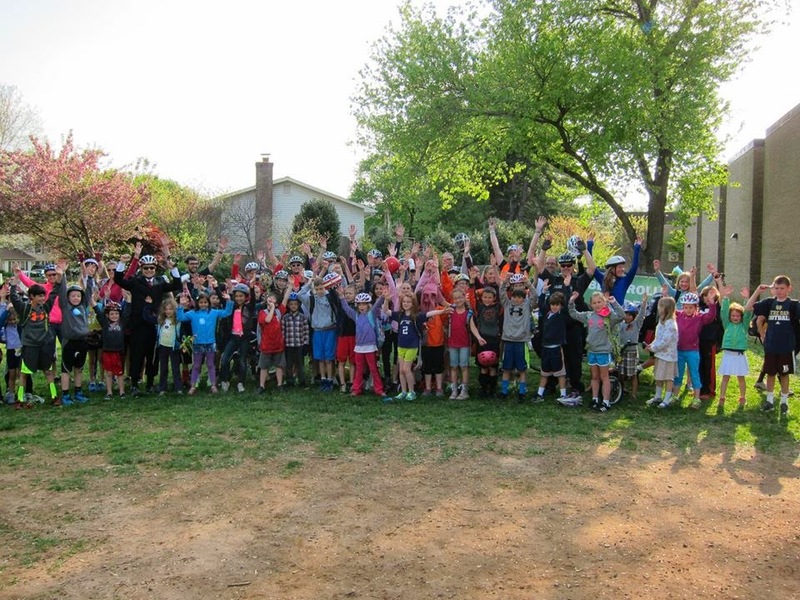 After a Reston school hit a new high on National Bike to School Day, Vienna rallied the kids, parents and teachers to set a new high on Thursday of 155 and again on Friday of 186. Can 200 bikes actually be within reach of any school? The coffee shops were a buzz as it's customers were wondering out loud if they took a wrong turn and ended up in Portland. Kudos to the teachers who took time out of their morning planning to greet kids at various meet up points and ride in. The third spot was taken up by Wolftrap, the only school that participated in all six years for the entire week. Wolftrap with it's bike train culture ran one that passed through the Old Courthouse Road S-Curve, which is on the County's list of projects to create safer bike conditions. A second bike train was run from within the Town of Vienna limits. We've heard that the parents will make that bike train a weekly event for the rest of the year. In addition, those kids had a great time delivering bike safety tips and the weather with ABC7 on National Bike to School Day. While Marshall Road ES had lower numbers than past years, a large number of students braved the construction zone where a school addition is being built. Several children rode in the bike train, which saw its numbers increase every day throughout the week and set a new week-long bike total. It was even heard of students in early morning programs (French, Spanish, Fitness Warriors) running a bike train on their own!!! Louise Archer, with notoriously difficult walking routes, has spent the last two years working with parents to encourage more walking. It's rumored that a bus stop was eliminated as a direct result of this week long Challenge. A group of Louise Archer students who attend that school's AAP center, but whose base school is Vienna, organized a bike train originating at Vienna Elementary School. How's that for leveraging how schools can work together? With that kind of effort, Louise Archer also set a new week-long high of bikes to school. Cunningham Park also had a slight down year but the ever popular Casey the Cardinal, their giant red mascot, greeted walkers and bikers with 'free high fives'. Even commuters on the way to work on Park St. were excited to see Casey. Any ideas on who is inside? The week is a lot of fun and huge thanks go out to the students who love it and have fun, parents who see just how important walking and biking to school is, and the school's principals, staff and teachers who get the direct benefit - kids ready to learn all week long. We'd also like to thank the Vienna Business Association for recruiting 30 businesses to donate a percentage of week long sales to the seven schools. Community involvement is always important. Keep up the momentum kids. Great job on showing how to get to 'your' workplace for the adults who will join Bike to Work Day on Friday, May 16. We look forward to the 7th version of the Challenge next year, tentatively scheduled for May 4th-8th. Dr near the Wiehle-Reston East Metro station. 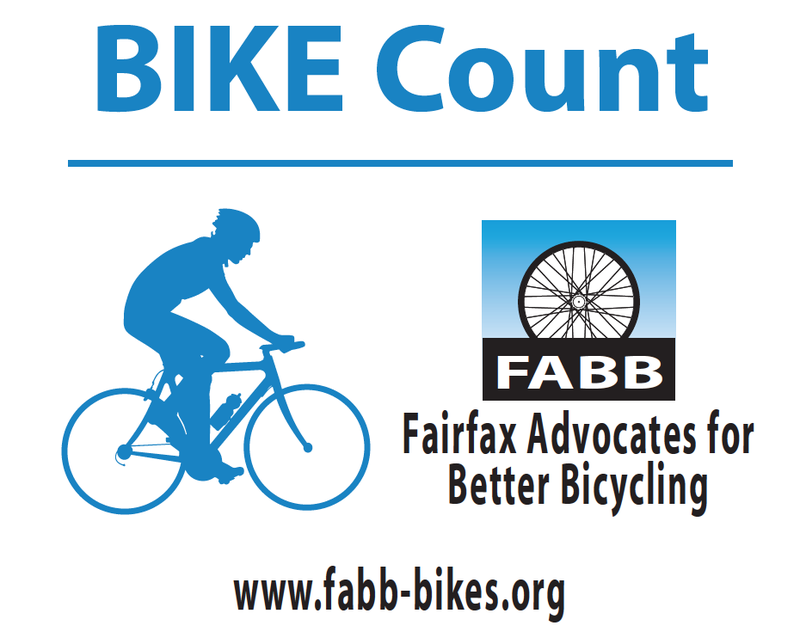 FABB volunteers were out counting cyclists on Thursday at several locations around the county. Our next count is tomorrow, Saturday, from noon to 2 p.m.
We still need two count volunteers at the W&OD Trail at the Fairfax County Parkway trail, and at the W&OD Trail at Gallows Road. If you can help count cyclists at either of those locations from noon to 2 p.m. tomorrow, please let me know. All schools had great turnouts today after their Walking Wednesdays spikes. Vienna set what we believe is a county-wide record of 155 students ride bikes to school today - that's 41% of K-6 students in attendance. We’re seeing a lot of young cyclists getting involved this year. Vienna Mayor Laurie DiRocco was handing out Biking Viking wristbands to the students that biked in. 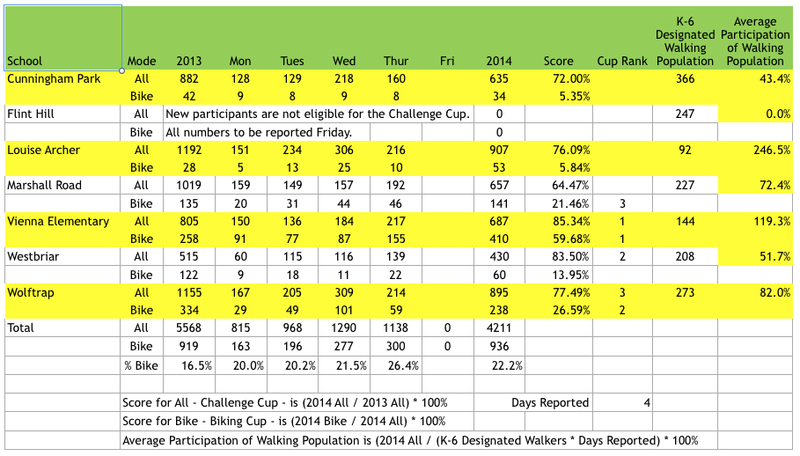 With the addition of 62 walkers Vienna Elementary beat their Walking Wednesday totals (as did Westbriar) and has retaken the lead for the Challenge Cup. Vienna appears to have a well deserved lock on the Biking Cup but both Wolftrap and Marshall Road deserve recognition for their exceptionally strong biking numbers. Wolftrap has slipped to third place in the Challenge Cup with a strong showing by Westbriar. Westbriar is currently a very close second to Vienna and Louise Archer is licking at the Wolfie’s heels. A strong turnout by either Westbriar or Louise Archer is all that is needed to capture the Challenge Cup for the first time. Westbriar had their best day yesterday and is poised to set a school best tomorrow. Louise Archer is making a push including running a bike train from Vienna Elementary. It would be quite an end to the challenge if mostly former VES students have a hand in spoiling a VES sweep. Today was the 3rd Annual National Bike to School Day and Fairfax didn't fail to deliver. The day started out early when the kids at Wolftrap ES joined forces with Eileen Whelan of ABC7 in delivering the day's weather. Eileen later escorted the kids to school in the ABC7 Storm Chaser Hummer. And across the county many other kids were rolling to school. Almost 1200 kids at the follow 19 schools reported huge numbers of riders. Four schools had over 100 bikers with a few getting very close. Kids who didn't biked walked in droves. What a great day with lots of fun stories and memories. Cunningham Park 9 (209 walkers) - Casey the Cardinal greeted students. Haycock 54 - Great job now that old policy changes were just removed last week. Forest Edge 81 - Only started promoting this in the last week or so. Dogwood 24 (400 walkers) - This school knows how to get walkers out. Hunters Woods 25 - Principal scootered in and Asst Principal rode in. Kent Gardens - 121 bikes. Another century of bikes in the bag. Kilmer MS - 126 walkers and bikers. Langston Hughes 28 - Ride organized by a student . Sunrise Valley 114 - The W&OD must have been swamped. Vienna 87 - Rolling out with the Mayor and Hunter Mill Supervisor on Thursday. Westbriar 11 (105 walkers) - Students were carrying flowers for teachers so walking was the mode of choice. Wolftrap 101 (1 unicycle) - Rode with Fairfax Police Bike Patrol, Fairfax County DOT and WABA. And National Bike to School Day was also the third day of the Vienna Bike/Walk Challenge, a loose contest that is designed to challenge kids and parents to ditch the cars (and even buses if possible) and ride or walk to school. With a strong showing at the midway point, Wolftrap took over the 'proverbial' lead. With two days left and awesome weather on the way, many more kids are expected to continue riding. It's amazing how a single event day can set the trend for several weeks after. 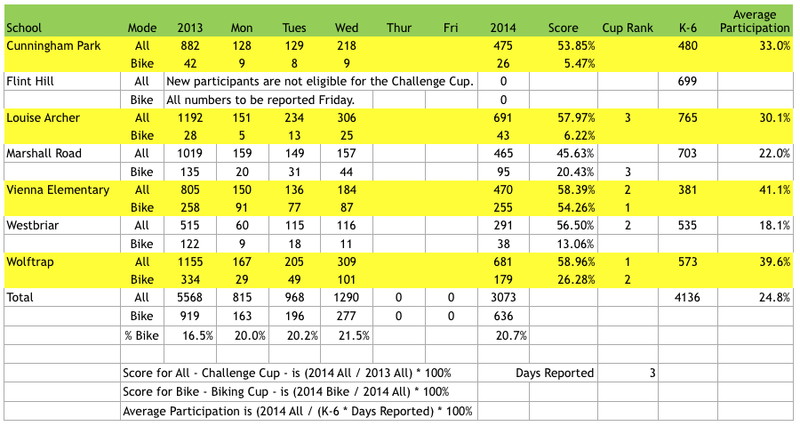 The Overall Challenge Cup is so close that it's really the school that can rally it's students that will move ahead. To date over 3000 students have walked and biked to school this week, with near 650 them on bikes. The schools are on track with last year's total walkers and bikers at about 3100. Will they break last year's numbers? Let's go kids! Lastly, today was also the grudge match between the Reston and Vienna communities. This past October, Vienna eeked out a win over Reston on International Walk to School Day with a little over 60 more walkers. It was clear from the very first reports in that Reston was ready for battle. When the final numbers were tabulated, Reston had more than double the bikers than Vienna. With 3 schools over 100 and one within 2 riders of such, Reston showed up Vienna which had only one school over 100. 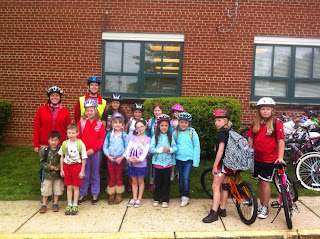 634 kids rode their bikes to school in Reston while 308 rode in Vienna. Congrats to Aldrin, Armstrong, Forest Edge, Dogwood, Hunters Woods, Lake Anne, Terraset and Sunrise Valley for bike bragging rights for the next year. Only 7 days have passed in Bike Month and the kids are setting a high bar for the adults who will bike to work next week on Friday, May 16. 40 mph last June, a Fairfax County prosecutor said. Several pedestrians leapt off the Washington & Old Dominion Trail to avoid being struck, but Joseph Suriol, 65, never saw the car coming, and it plowed into him as he biked near Vienna. Chopra kept going. By the time police caught up with her, she was driving on a rim that was sparking and could not stand when asked to perform a field sobriety test, the prosecutor said. A breath alcohol test registered nearly two and a half times the legal limit. On Tuesday, Chopra, 29, of McLean, pleaded guilty to misdemeanor driving while intoxicated and hit-and-run charges for the bizarre incident after reaching a deal with Fairfax County prosecutors to avoid a more serious felony charge. She was sentenced to nearly six months in jail. Suriol, of Vienna, said he had hoped for more. The crash left him with a broken arm, a head wound, a dislocated shoulder and a blood clot in one leg. A purple scar snakes down one side of his face. “I am disappointed she committed a felony, but ended up charged with a misdemeanor,” Suriol said after the hearing. 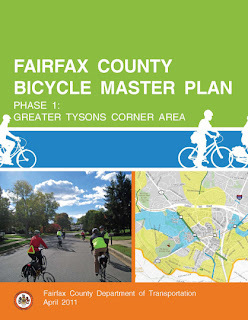 At today's Transportation Committee meeting the Fairfax County Board of Supervisors received a briefing on the Bicycle Master Plan along with printed copies of the latest draft. Charlie Strunk, the county Bike Coordinator, gave a brief overview of the plan. The four quadrant maps that contain recommended bike facilities were not presented as they are not yet final. We hope to have an electronic copy of the plan available in the near future on the county bike plan site. HB 2313 Funding: I am very concerned with the comment that most bike and ped projects do not qualify for HB 2313 local or regional revenues and that many of those projects need to be funded from the transportation bond. Many jurisdictions are including bicycle and pedestrian facilities in their project lists. Providing bike/ped access is critical to making mixed-use, transit-oriented developments successful. Arlington has shown that providing good transit, ped, and bike facilities does relieve congestion. Supervisor Foust noted that most people who attended the Countywide Dialogue meetings wanted better bike and ped access, and they expected them to be funded with the HB 2313 funds. Mode Share of Bike/Ped: It's estimated that 10% of all trips are made by walking and biking. Fairfax does not have a bike and pedestrian counting program so it's very difficult to estimate how many trips are made by bike. We have two first class bicycle facilities in the county, neither of which is managed or funded directly by Fairfax County; the W&OD Trail and the Mt. Vernon Trail. Several years ago it was estimated that each trail attracts over 2 million trips/year, and use has grown recently (at least that is our perception). Residents from around the county drive to these facilities because bike conditions are so poor elsewhere. Trail congestion is getting to be a major problem. If safe bike conditions were available throughout the county, many more people would ride. Fixing Past Mistakes: Supervisor McKay noted that most of the $200 million in bike/ped projects is for fixing what was built in the past. Of that $200 million, I've estimated that only $11 million is for bike-only projects. Most are pedestrian projects. Some are bike/ped. Supervisor McKay's comparison of the Woodrow Wilson Bridge vs. Springfield mixing bowl was very apt. This weekend my wife and I rode from Reston to National Harbor using the WW Bridge trail. There was a very diverse crowd of trail users on the bridge on Sunday and a significant number on Monday. I wouldn't think of riding anywhere near the mixing bowl. We need to fix our past mistakes and begin building a real bicycle network in the county, starting in our Activity Centers. Maintenance Funds: Supervisor Gross highlighted a major problem that has been raised by other Board members; the very poor condition of our trails and sidewalks in general and especially during and after snow events. There is almost no maintenance money for maintaining what we have. Fortunately VDOT and the county have allocated funds to finally start to fix the Fairfax County Parkway trail. Much more needs to be done and we need to find the maintenance funds soon. 16 Foot Sidewalks in Tysons: I am attaching some photos of a section of Route 7 sidewalk in Tysons near the Spring Hill Metro station, south side. You will see in one photo that about half of the sidewalk, which I estimate to be around 12 feet wide, is taken up by large metal grates that will (or do now) hold trees, leaving approximately 4 or 5 feet on one side and about 2 feet on the other side, barely enough for a sidewalk much less two-way bike access. I assume a similar design will be used on the north side. The second photo shows a sign taking up a majority of the sidewalk. When the new Metro stations open with many pedestrians walking to the stations, the Route 7 sidewalk on the south side is not an appropriate bike facility which is why FABB thinks that bike access on Route 7, a major future destination for bicyclists, is inadequate. Bicyclists riding on the road: Federal guidelines for bike facilities (AASHTO bike guide) state that in order for a bicyclist and motorist to share a lane safely it should be 14 feet wide. Most lanes in Fairfax County are 12 feet or less, meaning that most lanes cannot be safely shared by bicyclists and motorists side-by-side. Sharrows (shared lane markings) indicate that cyclists should ride in the lane and motorists must wait until it is safe to pass. Without a completed bike (or pedestrian) network it is almost impossible to ride a bicycle for transportation in the county without riding in the road. It has been shown that riding in the road is often safer than riding on the sidewalk because of the many potential conflicts on sidewalks between bicyclists, pedestrians, and motorists exiting and entering the road in disregard of oncoming cyclists. Bicyclist's behavior: Unfortunately too many bicyclists are seen "blowing through stop signs and traffic signals." Wouldn't it be nice if bicyclists were taught how to ride safely? They are not. The bicycle curriculum in our schools is not taught. Drivers education is available to almost everyone but very few people learn to ride a bike safely. Unfortunately most motorists also often disregard the law, and they can cause much more damage. On my ride to the Government Center to attend the committee meeting I saw motorists breaking the law at almost every intersection by running red lights when making right turns, and rolling through STOP signs. Three motorists nearly hit me as I rode past them on the West Ox trail as they rolled into the intersection from cross streets, assuming that they could roll through the STOP sign. When I drive the speed limit in my car I am constantly passed by speeding motorists. We all need to obey the law. FABB is working with police on this topic. Bicycle Master Plan: The Plan will address many of the concerns raised by the Board through the policy and facility recommendations. I look forward to passage of the Plan and eventual implementation. Please contact me if you or your staff would like to discuss these issues further. In other news at today's Board of Supervisors Transportation Committee meeting Tom Biesiadny, head of the Department of Transportation, announced that most of the $200 million in bicycle and pedestrian projects that were to be funded by the $1.4 million allocated by the state, "do not qualify for HB 2313 local or regional revenues." Instead he is recommending that most of those projects be part of the 2014 Transportation Bond. In other words, the community was told that $200 million would be spent on bike and ped projects and now those funds are in doubt. There has been criticism from the Northern Virginia Transportation Alliance (NOT the Authority, the other NVTA) and a few conservative members of the Virginia House about funding of ped/bike projects with HB 2313 funds. We wrote about Del. LeMunyon's concerns, but he was only talking about regional funds, not local. 70% of the HB2313 funds are for regional projects and 30% are for local. Other jurisdictions are including bike/ped projects in regional and local funds and so should Fairfax County. Few details were available about which funds are still included in the HB2313 funds. The Board was told that info will be available on the county website. Once more information is available we'll report it here. Update May 27: Presentations are now available on the Transportation Committee website. Tomorrow is National Bike to School Day - have fun! Every day this week FABB will be reporting on the Vienna Schools Bike/Walk Challenge. This is the 6th annual version, with all seven schools in Vienna participating this year. The schools include Cunningham Park, Flint Hill, Louise Archer, Marshall Road, Vienna, Westbriar and Wolftrap. Last year saw Wolftrap awarded the Overall Cup and Vienna repeated for the Biking Cup. Westbriar was awarded the Rookie Cup. Over 5,500 kids biked or walked during the week last year. So let's get to Day One results. The morning arrived with perfect weather to ditch the car or avoid the bus and walk or bike to school. Last year 866 students walked or bike to school on Day 1. (Note: Only six elementary schools participated 2013). This year 888 students got to school in what we consider the best method possible - self propelled. The numbers for all seven schools are below but it looks like Vienna has a slight lead in the Overall Cup. This one often comes down to the last day as momentum builds over the course of the week. Vienna also had an impressive 91 students ride to school today. 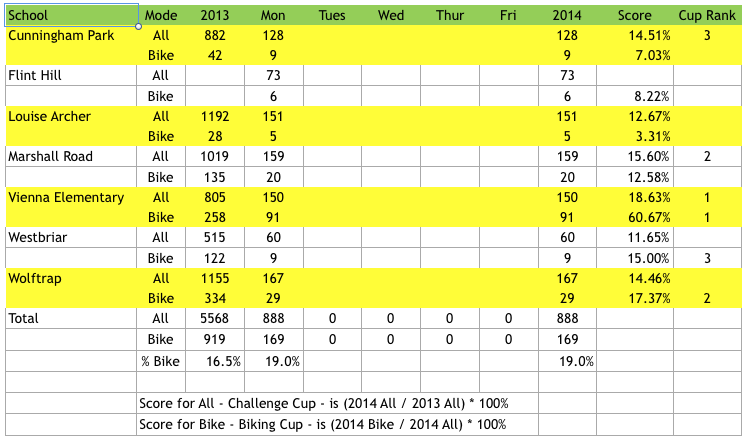 That 60.7% puts it in a big lead in the Biking Cup. Their Bike Friday initiative has certainly paid off. Weather for Day 2 looks to have some residual rain from over night but it should be out of the area by the time wheels and feet hit the pavement. Per NOAA, a chance of showers before 8am. Partly sunny, with a high near 69. Light and variable wind. Chance of precipitation is 30%. Great job kids. Keep up the great work. Here are the results (revised on May 6). Click on the image to enlarge it. Bike to School Day is Wednesday, May 7. The long process of approving the Countywide Bicycle Master Plan is still underway. Public hearings before the Planning Commission and Board of Supervisors that were planned for May and June were recently postponed. Two countywide public meetings are now planned as a way to inform the public about the latest versions of the plan and recommended facilities maps. While we are frustrated by the slow progress, the public meetings will be an opportunity for cyclists to learn about the latest drafts of the plan. This information should soon be available on the county bike plan webpage. Once the public meeting dates are announced, we will spread the word via FABB social media and other outlets. The official public hearing dates will likely be announced after the public meetings are held. Stay tuned. The first phase of the Fairfax County Parkway Trail Repair began in April. Work crews started at Route 7 and will continue south to Route 29 through the summer. Only the most damaged sections of the trail will be repaved. Where large cracks have developed but the remainder of the trail is in good condition, the cracks will be filled and sealed. Trail sections being repaired will be closed between 8 a.m. and 4 p.m. There will also be some nighttime work done between 9 p.m. and 5 a.m. Trail users should be able to carefully bypass work in progress if they are traveling during construction times. Informational signage and maps are being posted on site. See the FABB blog for more info, including examples of signs and maps posted at each end of the work area. Tour de Fat returns on Saturday, May 31 to Yards Park in DC. The party starts with a costumed bike ride at 11 a.m. and includes music, games, food, and beer from New Belgium Brewery, makers of Fat Tire Ale. Tour de Fat is a major fundraising event for FABB. Our volunteers check IDs and attach wristbands during the event to allow attendees to purchase alcohol. In exchange we receive a portion of the proceeds. Volunteers receive a free t-shirt and two beer tokens. We will likely form bike convoys of volunteers to the event. We need volunteers for the the morning (10-1:30 p.m.), midday (11:30-3:00 p.m.) and afternoon (1:30-5 p.m.) shifts. Contact us at chairman@fabb-bikes.org to volunteer. Join FABB for rides, food, and fun at Tour de Tysons bicycle race on Sunday, June 29. The organizers of the bike race, National Capital Velo Club and Tysons Partnership, support all types of bicycling in Tysons. The race course will be on a loop in the vicinity of Tysons Corner Metro Station. FABB is sponsoring a family ride on the course during the event. Related activities will be held near the Tysons Corner Metro station. Check the FABB Tour de Tysons page for details as we get closer to the event. 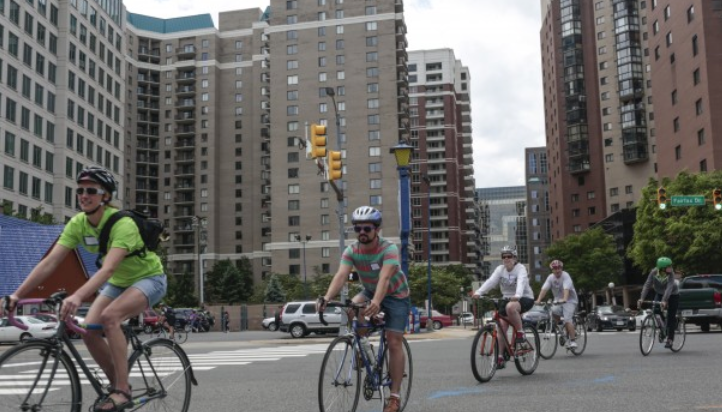 Bicycle caravans demonstrating three routes to the Tysons Metro stations and to get cyclists to the event from three different points, arriving at 9:30 a.m.
Food trucks and other vendors will be present. Commuter Seminar - "How to Ride Your Bike to Work - save money, have fun!" 10:30 a.m. in front of Firehook Coffee Shop. FABB table with maps and bike-related info. Plan on joining us for a great way to experience Tysons! If you want to volunteer to help, please contact alan.g.young.sr@gmail.com. On Wednesday May 7 schools around the country will celebrate the third annual National Bike to School Day. Twenty-five schools in Fairfax County have registered so far. Lots of activities from bike trains to bike rodeos are planned at the various schools. Other events include safety clinics, helmet and token giveaways, and free coffee for the parents. Several schools in Reston and Vienna are challenging one another for "Most Bikes" bragging rights on this day. In addition, the Vienna schools are holding their 6th annual Bike/Walk Challenge week with trophies for overall walkers/bikers and most bikers. Follow along on the FABB blog for daily updates on this challenge. National Bike to School day is an effort to promote physical activity and reduce traffic congestion and pollution near schools. 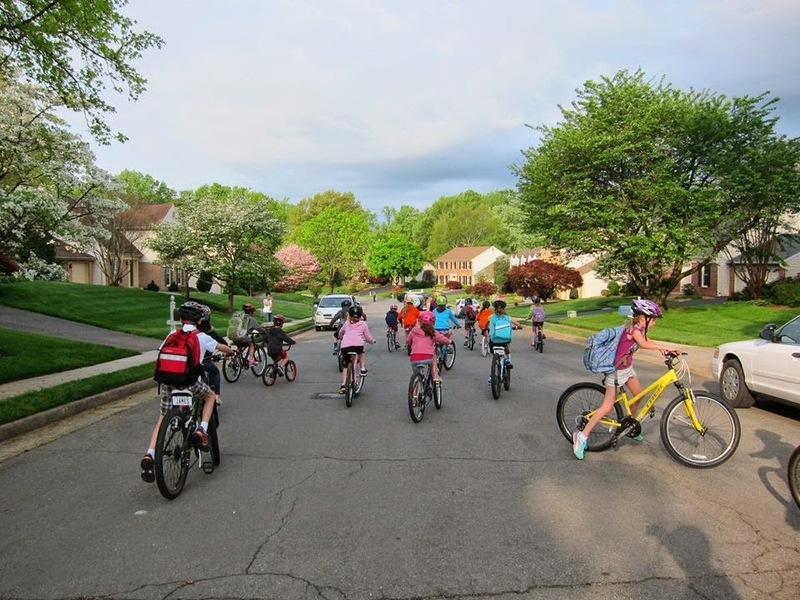 Fairfax County Public Schools have compiled information on walking and biking to school on their Safe Routes to School web page. Register now for Bike to Work Day, which is Friday, May 16. Two new Fairfax County events are being held this year, at Fair Lakes and McLean. We now have 12 events in Fairfax County, and we hope to have FABB reps at most of them. The Healthy Community Design Summit will be held on Tuesday, May 6. The Summit is a chance to "learn how communities throughout the U.S. are encouraging active living through design of the built environment. Hear from a panel of local business, development and planning experts about their strategies for and successes with integrating healthy design throughout the Fairfax Community. Brainstorm with your colleagues on ways to make your neighborhoods more friendly for pedestrians and bicycles and accessible to all people. Help craft a message for leadership that demonstrates the benefits of health in all policies – especially throughout the built environment." The event is being held at the Kena Conference Center, 9001 Arlington Boulevard, Fairfax. Check-in begins at 8 a.m.; the program will be from 8:30 a.m. to 12 p.m. Register for free at Eventbrite. Ladies, do you want to ride with other women? Three groups, Babesonbikes.org, WABA's Women & Bicycles, and Alexandria Spokeswomen, are just for you. These groups offer a variety of social and training rides. In addition, many local bike shops have no-drop women-only rides going on this spring. Invite a friend who might be interested in cycling to join you in this non-threatening atmosphere. May 3, Saturday - Vienna Bike Rodeo from 9 a.m.-noon at Vienna Volunteer Fire Department. May 4, Sunday - Alexandria Spokeswomen bike shop ride leaving from Jones Point Park at 10:00 a.m.
May 5, Monday - Safe Routes to School Workshop at Mt. Vernon Woods Elementary School from 12:15-3:30 p.m., facilitated by Mark Fenton, an expert on Safe Routes to School initiatives and walkable communities. May 6, Tuesday - Healthy Community Design Summit at the Kena Conference Center from 8:30 a.m.-noon. Mark Fenton is the keynote speaker. May 6, Tuesday - Bicycle Master Plan briefing at Board of Supervisors Transportation Committee meeting at Fairfax County Government Center. Meeting starts at 10 a.m.
May 7, Wednesday - Bike to School Day is celebrated at more than 25 Fairfax County schools. Is your school holding an event? May 10, Saturday - Reston Bike Rodeo at Lake Newport pool from 1-4 p.m.
May 11, Sunday - Crystal City Phoenix Derby from 2-6 p.m.
May 21, Wednesday, FABB Monthly Meeting, Vienna, VA.
May 31, Saturday, Tour de Fat at Yards Park from 11 a.m.-5 p.m.
June 18, Wednesday, FABB Monthly Meeting, Vienna, VA.
June 29, Sunday, Tour de Tysons.